You are here: Home › Further Reading › JFK Assassination FAQs › What is a Conspiracy Theory? Like all political terms, there is a dictionary meaning and a propaganda meaning. The JFK assassination provides a perfect example of the way the term 'conspiracy theory' is misused for ideological purposes. And What is a Conspiracy Theorist? The terms ‘conspiracy theory’ and ‘conspiracy theorist’ are widely used and misused. Several aspects of the JFK assassination illustrate the definitions that are often applied to these terms. To start at the end: a theory is an explanation that is supported by a reasonable amount of evidence. It is stronger than a hypothesis, and infinitely stronger than guesswork. A theorist is simply someone who proposes a particular theory. In any explanation of a historical or political event, such as the assassination of a president, there will always be facts which remain unknown or social forces and constraints which are imperfectly defined. Even when it is possible to state with certainty that a particular event occurred, it is never possible to give a complete account of the factors which caused that event. The most strongly supported explanations are still only theories. Defining a theory is straightforward, but defining a conspiracy is more complicated. A combination or confederacy between two or more persons formed for the purpose of committing, by their joint efforts, some unlawful or criminal act, or some act which is innocent in itself, but becomes unlawful when done by the concerted action of the conspirators, or for the purpose of using criminal or unlawful means to the commission of an act not in itself unlawful. The actus reus [the action that initiates a crime; literally, ‘the act the accused’ (bad Latin)] is the agreement. This cannot be a mere mental operation; it must involve spoken or written words or other overt acts. If the defendant repents and withdraws immediately after the agreement has been concluded, s/he is still guilty of the offence. There must be an agreement to commit the criminal offence, but the motives of the conspirators are irrelevant. For example, in Yip Chiu–Cheung v The Queen (1994) 2 All E.R. 924, the fact that one conspirator was an undercover police officer who only entered the conspiracy to catch drug dealers did not prevent the offence of conspiracy from being committed. For the ingredients of conspiracy, see Archbold 33–1 to 33–20. A conspiracy is two or more people acting together to commit a crime. A conspiracy is two or more people working together in secret to do something against the interests of others. A national or local government organisation will by default promote the interests of a powerful pressure group over a less powerful group. The executives of a company may decide to move its operations to a location which offers them a less well–organised workforce, in the interests of the company’s owners but against the interests of its employees. In an example that is relevant to the JFK assassination, a newspaper editorial board may decide to publish facts and arguments that represent only one side of a contentious issue. The primary function of government institutions is to represent the distribution of power that exists within their domain. The primary function of corporations is to maximise profit for their owners. Government representatives who take bribes to promote one set of interests over another, or company executives who authorise the use of violence to prevent their employees organising, would be working outside the powers given to them by their institutions. These would be examples of conspiracies, in the most useful sense of the word. A conspiracy is two or more people working together in secret, outside the rules of a social institution, to do something against the interests of others. Institutions are rarely uniform. It is essential to identify the levels within organisations that are responsible for specific events. or the CIA as a body may have been involved in the planning of the assassination. Although the difference between the two interpretations is enormous, it is not appreciated by many commentators on the JFK assassination. The probable involvement of a handful of individuals from the CIA is often mistakenly said to prove that President Kennedy was killed as the result of a high–level conspiracy. Both explanations can be defined as conspiracies, but each has a very different level of plausibility. A conspiracy theory is, in its most straightforward sense, an explanation that uses one of the above definitions of a conspiracy. A conspiracy theorist is someone who puts forward such an explanation. Most of the things that happen in the world do not happen as the result of conspiracies, in the sense of people acting outside institutional rules. Government officials rarely take bribes to favour one group over another. Company executives rarely promote the use of violence against their workforce. There is, however, one category of historical event in which conspiracies are not uncommon: the assassination of political figures. Julius Caesar was stabbed to death in 44 BC by a large group of Roman senators who, according to one interpretation, resented the threat his dictatorship posed to the power of the ordo senatorium; see Suetonius’ De Vita Caesarum (for anyone whose Latin is a little rusty, here is an English translation). An alternative interpretation is that what the senatorial conspirators found threatening to their interests was Caesar’s promotion of land reform and other extensions of democracy, limited though his actions were; see Michael Parenti, The Assassination of Julius Caesar: A People’s History of Ancient Rome , The New Press, 2003. Abraham Lincoln was shot dead in 1865 by John Wilkes Booth, one of three Confederate sympathisers who planned to make simultaneous attacks on Lincoln, the vice–president, Andrew Johnson, and the Secretary of State, William Seward. Archduke Franz Ferdinand was shot dead in 1914 by Gavrilo Princip, one of a group of seven people who intended to assassinate the archduke as he travelled through Sarajevo. All were members of the Black Hand, a nationalist organisation that hoped to unify Bosnia–Herzegovina and Serbia. Fred Hampton, a Black Panther activist, was shot dead in 1969 by Chicago police officers using information supplied by Hampton’s bodyguard, who was an FBI informant. Anwar Sadat was killed in 1981 in an attack using guns and grenades by several Islamic nationalist members of the Egyptian army during a military parade. Indira Gandhi was shot dead in 1984 by two of her bodyguards, Beant Singh and Satwant Singh. Both assassins were Sikhs who apparently acted in retaliation for the Indian government’s attack on the Golden Temple in Amritsar earlier that year. The only plausible explanation for these assassinations is that each was the result of a conspiracy. It is perfectly rational to hold a conspiracy theory about these events. William Blum, in Appendix III of his Killing Hope: US Military and CIA Interventions Since World War II , Common Courage Press, 1995, names dozens of notable political figures whose assassinations or attempted assassinations were instigated by one or more branches of the US state. Other political figures are considered insufficiently notable to deserve much press coverage when they are assassinated. In Guatemala, 64 trade unionists were murdered between 2007 and 2013. In Colombia, more than 60 trade unionists were murdered between 2010 and 2013. If investigative journalists can be described as political figures, the murder of Anna Politkovskaya in 2006 was certainly a political conspiracy. Even if only a minority of political assassinations are due to conspiracy, it is not unreasonable to suspect conspiracy in a political assassination which has no obvious non–conspiratorial cause. Why is the JFK Assassination Controversial? 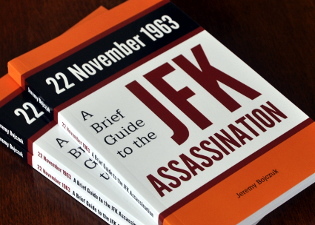 The proposition that President Kennedy was assassinated as the result of a conspiracy is usually presented in the media as a controversial point of view. In one sense, the idea is not controversial at all. Every objective observer who is familiar with the facts of the case, as well as a majority of the general public, is aware of the serious flaws in the official verdict that the assassination was the work of a lone assassin named Lee Harvey Oswald. The rifle was brought into the building by someone other than Oswald. The rifle was too inaccurate to have hit its target, except by accident. Oswald was not a good enough marksman to have performed the assassination. He almost certainly did not fire a rifle at all on the day of the assassination. He did not leave any incriminating finger prints at the scene of the crime. He was almost certainly not on the sixth floor during the assassination. The severe implausibility of the single–bullet theory implies that the non–fatal wounds to the three victims were caused by at least two gunmen. Oswald’s impersonation in Mexico City and his apparent visit to Silvia Odio in Dallas, two events which occurred about seven weeks before the assassination, show that he was set up in advance to take the blame. The Warren Commission’s conclusions were decided upon several days before the Commission was established. The assassination is only controversial because of the existence of an official verdict. There is little evidence to support the official verdict apart from the fact that it is the official verdict. From the point of view of the news media, an official statement is, almost by default, the truth. [The Warren Commission] was headed by the chief justice of the United States, and staffed by a future president, senators from both parties and some of the country’s best attorneys and statesmen. He goes on to conclude, bizarrely, that “the probity of the commission is indisputable.” In other words, he sees the institutional loyalties of the Commission’s members as a good thing rather than as an obvious mechanism for preventing an honest consideration of the facts of the assassination. Such is Franklin’s inability to question authority that he even points to the absurd suggestion that JFK was killed accidentally by a Secret Service agent, and claims that it is an example of a conspiracy theory. It contradicts official doctrine, so it must be a conspiracy theory. As a few seconds’ thought would have revealed, it is of course the exact opposite of a conspiracy theory. It is very much a non–conspiracy theory, perhaps the most plausible one yet imagined. Some of Franklin’s other points were refuted by Oliver Stone and Zachary Sklar in ‘Yes, there was a cover–up” Chicago Tribune , 18 September 2013. The reluctance of commentators in the newspapers and on television to acknowledge reasonable criticism of the lone–nut hypothesis is simply an aspect of the media’s identification with the interests of established institutions. The same behaviour can be seen in far more important and immediate matters than the JFK assassination. Modern history, just as much as theology and economics, is an ideological discipline. The circumstances and causes of Julius Caesar’s assassination pose no risk to popular support for any current social institutions, but the assassination of President Kennedy happened just a few decades ago and is still subject to the constraints of modern history. As a general rule, events do not happen as the result of conspiracies. It is irrational to work from the assumption that a particular event is the result of a conspiracy, or to give the benefit of the doubt to a conspiratorial explanation when an event lacks a clear cause. A conspiracy theorist is someone who attempts to explain events as conspiracies when the evidence does not justify it. Three tramps were photographed in Dealey Plaza a couple of hours after the assassination. They appeared to be under arrest, but no records of their arrest existed. One popular theory speculated that the tramps had been involved in the assassination, and that the policemen who were escorting them past the Texas School Book Depository were assisting their escape from the scene of the crime. The theory was debunked nearly three decades later, when the men’s police records were discovered and the two surviving men were tracked down. They were indeed tramps who just happened to be in the wrong place at the wrong time. A news photograph of the assassination depicted a man who resembled Lee Harvey Oswald standing in the doorway of the TSBD during the shooting, when the alleged assassin was supposed to have been on the sixth floor of the building with a rifle in his hands. This interpretation was taken seriously by, among others, the FBI. It later turned out that the man in the doorway was almost certainly a colleague of Oswald’s named Billy Lovelady. Very few people nowadays believe that the man in the photograph is Oswald. These conspiracy theories were not especially unreasonable, given the state of the evidence at the time. When it became clear that the theories were contradicted by strong evidence, support for the theories dissipated. Apparent inconsistencies between the Zapruder film and the testimony of eye–witnesses led to a theory that the film had been altered or even completely forged. Other inconsistencies, this time between the testimony of eye–witnesses and the photographic evidence of JFK’s wounds, gave rise to a theory that President Kennedy’s body had been surgically altered before the autopsy to cover up evidence of shots from the front. There was no opportunity for the Zapruder film to be altered before copies had been widely distributed, and many of the alterations that have been proposed would not have been possible using the technology of the time. The theory of bodily alteration required that the body be stolen from under the noses of a plane–load of people on Air Force One, and that the conspirators included a large cast of kidnappers, transport teams and surgeons, for whose existence no plausible evidence has been produced. Neither of these unlikely theories attracted much support to begin with, and neither has lost much support since detailed criticism of the theories became widely known. Unlike those who had put forward the first two theories, their proponents seem to be impermeable to rational criticism. The majority of rational critics of the official verdict on the JFK assassination are equally critical of the more paranoid conspiracy theorists. Curiously, the news media, which in general is keen to discredit suggestions that President Kennedy was not killed by a lone nut, gave a good deal of publicity to a book which promoted the ludicrous body–alteration conspiracy theory. A conspiracy theory is an idea I disapprove of, but which I am unable or unwilling to argue against. therefore anyone who puts forward any conspiracy theory is crazy. By conflating the ideological and non–ideological definitions of ‘conspiracy theory’, propagandists attempt to disarm criticism of authority. As a general rule, historical and political events are the result of social and institutional forces rather than the actions of individuals. The Second World War did not happen because Hitler wasn’t a very nice person. The Civil Rights Act of 1964 did not come into existence because Lyndon Johnson personally disliked racial discrimination. Hitler had no responsibility for the German economic crisis of the 1920s and 1930s, and Johnson was no more enlightened than the average rich white Texan of his generation. Although the actions of prominent individuals may play a part in explaining the details, they rarely have a detectable impact on the wider event. The standard procedure of conspiracy theorists is to analyse events in terms of the actions of individuals. Sometimes an event is indeed caused by individuals acting as an ad hoc group outside the rules of social institutions, and the related conspiracy theory is justified. As a way of analysing social problems, however, this method is flawed. It is almost always a mistake to think that such problems can be solved merely by identifying a few bad apples rather than by analysing the relevant institutional forces. Looking for the problem in the wrong place ensures that the problem will not be fixed. It is often claimed that President Kennedy was assassinated because he had intended to withdraw US forces from South Vietnam, or to reduce the power of the CIA, and that this high–level conspiracy is the cause of many of today’s social problems. If the assassination turns out not to have been due to a high–level conspiracy within the US government, a lot of people have been spending their time fruitlessly. Propagandists sometimes describe institutional forces as conspiracy theories, usually in order to disarm criticism of the institution in question, but sometimes because the commentator genuinely interprets events in terms of the actions of individuals. For example, to point out that the primary function of corporations is to maximise profit for their owners is often to be accused of proposing a conspiracy theory. Even though corporations are obliged by their institutional rules to maximise profits, their supporters rarely acknowledge this function, at least in public. The actions of a corporation are described instead as the result of individuals acting out of a general sense of duty to humanity, in a reverse image of a conspiracy. A conspiracy theory is an idea which I would prefer you not to think about. One of the few remaining Marxists, Noam Chomsky here undertakes to scold fellow leftists such as Oliver Stone for succumbing to the Camelot myth and asserting that JFK was assassinated by big business, the Central Intelligence Agency, the Mafia, or the Joint Chiefs of Staff (take your choice) because Kennedy intended to pull out of Vietnam. Chomsky rightly ridicules the notion of a Vietnam pullout but — typical of his past political assays — he sees dark, conspiratorial forces directing most actors on the public stage. In Chomsky’s world view, presidents are puppets manipulated by America’s economic managers (corporations and their lackeys in politics). Thus Kennedy had no freedom of choice but merely did as he was told. If something comes along that you don’t like, there are a few sort of four–letter words that you can use to push it out of the sphere of discussion. If you were in a bar downtown, they might have different words, but if you’re an educated person what you use are complicated words like ‘conspiracy theory’ or ‘Marxist’. No discussion of the terms ‘conspiracy theory’ and ‘conspiracy theorist’ would be complete without mentioning the September 11th attacks on the World Trade Center and the Pentagon. Any sane person who has an opinion on the 9/11 attacks is a conspiracy theorist. There were 19 hijackers, all doing the same thing on the same day; if it wasn’t a conspiracy, it was an outrageously unlikely coincidence. Yet the terms ‘conspiracy theory’ and ‘conspiracy theorist’ are not applied to everyone who holds the uncontroversial belief that the attacks occurred as the result of a conspiracy. The attacks were carried out entirely by the 19 hijackers, and the US authorities were taken by surprise just like everyone else. Although the attacks were carried out entirely by the hijackers, the US authorities had a notion that something may have been about to happen, but did nothing about it either because they did not have enough information or because of bureaucratic incompetence. Although the attacks were carried out entirely by the hijackers, the US authorities suspected that a terrorist act of some sort was likely to happen, and deliberately failed to prevent the act. Although the attacks were carried out entirely by the hijackers, the US authorities knew in detail what was going to happen, and deliberately allowed the attacks to go ahead. The attacks were an inside job by the US authorities, who demolished the buildings by using controlled explosions. Not only did the US authorities demolish the buildings by using controlled explosions, but they also faked the images of jet planes crashing into the towers. Theories 1 and 2 are plausible and are treated with respect by media commentators, who generally do not describe these conspiracy theories as conspiracy theories. Theories 3 and 4 may or may not be plausible, depending on one’s view of US nation–state institutions and their willingness to allow thousands of people to be killed for political ends. Neither theory is treated with respect, and each is usually labelled as a conspiracy theory, in a pejorative sense. Theories 5 and 6 are ludicrous, and are always labelled as conspiracy theories. Expert opinion is overwhelmingly against the suggestion that the collapse of the World Trade Center towers was consistent with controlled explosions, and equally in favour of the plausibility of the official explanation (see e.g. ‘9/11: Debunking the Myths’, Popular Mechanics , March, 2005; http://www.skeptic.com/eskeptic/06-09-11/; and http://www.skepdic.com/911conspiracy.html). Such a conspiracy could not have been kept secret. As well as planting explosives, it would have been necessary to cut most of the way through many of the steel joists in both towers. The process would have required the services of a large number of conspirators over a large amount of time, and could not possibly have been carried out undetected within functioning office buildings in the middle of one of the busiest cities in the world. In contrast, only a handful of people would have been needed to shoot some guy in a car and to hide a rifle in a book warehouse while almost all of its employees were outside watching the guy in the car. It would have been a self–destructive decision. Once the deception was uncovered, it would eliminate popular trust in the nation–state institutions that enforce the existing distribution of domestic power. The need to maintain popular trust in institutions, which rules out the inside–job theory, was the motivation behind the adoption of the lone–nut hypothesis in the JFK assassination. The impersonation of Oswald in Mexico City, which implicated the Soviet and Cuban regimes in the assassination, demanded that Oswald be declared solely responsible and that he had no political or ideological motive.